We just learned about the Holy Thorn Reliquary. Another Gothic Art sculpture was the Bamberg Horseman, made in Germany around 1225 AD. This is a statue of a man riding a horse, and the man is either a king, emperor or saint, but no one knows for sure who it is supposed to be, because the history of it was lost or forgotten. There were many statues of people on horses long ago, but for a long time people had stopped making statues like that until the Bamberg Horseman was made. It is also one of the first statues to show the bottom of a horse's foot wearing a horseshoe. Underneath the front part of the statue where the horse is standing is a sculpted face that looks like a man's face made out of leaves. 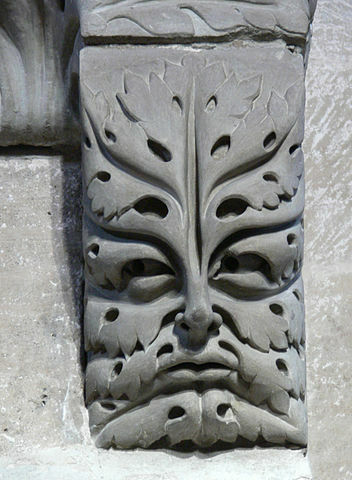 This type of sculpture is sometimes called the "Green Man" and can mean a lot of different things like respecting nature, the growth of spring, or maybe even mythological creatures.